Are you ready for back to school? 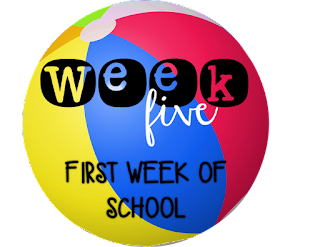 It's our last week of the summer blog hop and this week is all about the first week of school. 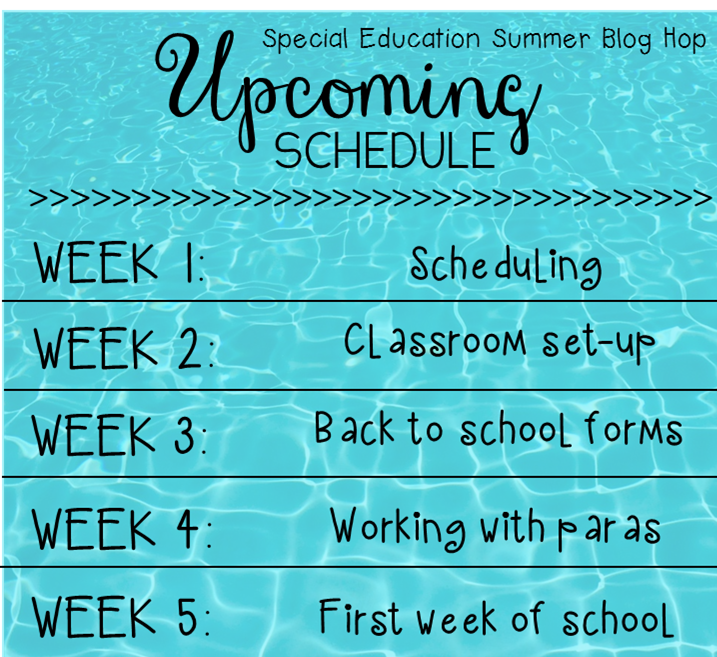 Originally, this post started as a post where I was going to share with you my BOY checklists and what I do the first week of school in my classroom, but then I received a message from one of my readers asking me a great question! Quote: I accepted a position in a new district and it's a second grade behavior self-contained class. I am very excited, yet very anxious about the beginning of the school year. 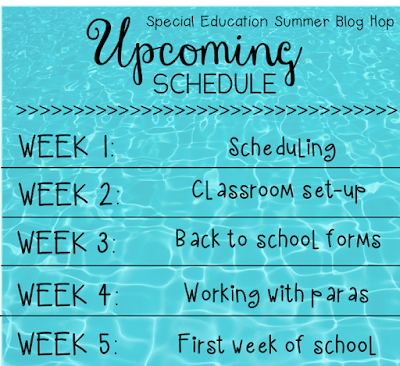 I saw on your blog that your specialty is behavior and was wondering if you have any pointers for planning the first week of school and any strategies to use with students who are ED and ODD. I would really appreciate it! So I thought it would be perfect to use her question as the focus of this post and to hopefully benefit others as well that may be going into a new year with challenging behaviors! 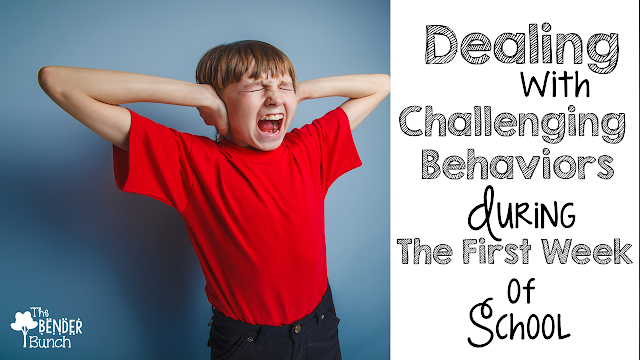 Here are some pointers for tackling those challenging behaviors for your new students. 1. Review the child's IEP and check to see if there is a BIP (Behavior Intervention Plan). There should be a BIP, but it is not uncommon for there not to be one. Familiarize yourself with what the child's behaviors are, the function, settings, reinforcement menus, etc. 2. Designate a "safe spot" or a "cool down area" in your classroom where students can go to de-escalate. Make this area soothing and inviting, but safe and free of obstacles they could use to further hurt themselves. Also have an area where you can easily block and contain the student if needed. 3. Put a crisis management plan in place. Have a plan in case of crisis. For example, what will you do if the child if the child starts throwing things? Will you remove the students from the room, where will you take them, who will take them? What will the procedure be if you have a runner? 4. Have a classroom management system designed and in place to begin on the first day of school. How will you manage classroom behaviors as a whole? Clip chart, stoplight method, whole group token system, cards flipped, etc. 5. Get organized! Your unorganization can cause chaos for the ED or ODD child. 6. Share all of this information with your classroom aides and other staff that may be involved. I provide an instructional plan to my aides for each student. You can grab a copy of my instructional plan here. 1. Begin building a rapport/relationship with the student from the start! Introduce yourself. Tell them how happy you are to have them in your class. Most of these students are used to not being liked and being rejected. Make them feel wanted. Begin building trust. You could even begin this process prior to the start of school, by sending them a postcard or dropping them a phone call. 2. Give the students a tour of the classroom, showing them all of the areas/centers and areas that may be off limits. Show them the cool down area and explain what it will be used for. 2. Review classroom procedures and set clear, concise expectations from the start. Remember, it is easier to lighten up than it is to toughen up! Check for understanding. For instance, after reviewing your procedures...ask the ODD child, "Ok, what are you going to do if you need a drink of water?" Child: "Raise my hand." Make sure they understand and post visuals of these rules and procedures in your classroom that they can understand. 3. Practice, practice, practice!!! Spend the first day practicing procedures. Practice walking in line, practice fire drills, practice center rotations, etc. Make it fun by making it into a game. 4. Be consistent!! Set your rules and guidelines and stick to them. Never negotiate! Consistency is key! 1. Conduct a reinforcement assessment immediately on the first day. Hopefully if the student had a BIP, you already have a good idea of powerful reinforcements for the student. If not, you will want to conduct an assessment right away! To do this, sometimes you can just ask the student what their favorite things are. You can also ask their parents. Another way is to provide the students with free time in the classroom providing a variety of toys, games, activities, crafts, computer,etc. and sit back and watch. Let them have the run of these things.What does the child seem to be enticed by? What are they playing with the most? At the end of the school day, take these items and put them away and make them only available contingent upon good behavior. Sometimes the most powerful reinforcement for a child may even be a particular snack or even a squeeze or verbal praise, so take note of these reactions during your assessment as well. Since I'm on vacation, I don't currently have access to my reinforcement assessments, but you can locate many online. 2. Give frequent positive praise. Catch them being good constantly. Be proactive. Don't wait for them to misbehave. Ex. "I love how well you're following directions. Great job!" "I love how you raised your hand to get out of your seat." 3. Always provide immediate feedback whether they're doing it right or wrong. In number two, I gave examples for if they're doing it right. If they're not, you might say, "I asked you to get out your notebook, but you're not following directions, can you please get out your notebook?" "Ok, now you're following directions, awesome possum!" Be funny, make them laugh when they're following directions! 4. If they continue not to follow directions, planned ignoring and recognizing students that are can be a great tool. Ignore the student, and maybe walk around the room saying to the other students, "I love how you're following directions," and place a couple of M&M's (one example) on that student's desk or something you know the defiant student really loves. 5. Don't give attention when the student is misbehaving (planned ignoring). We want to teach the student how to seek attention appropriately. Most of them are used to only getting attention when they misbehave and it is our goal to change that. 6. Because these students are so used to negative attention in their lives and living in a punitive world, don't be negative. Rather than using negative consequences, ignore when you can, and praise the good behaviors. Praise the best, ignore the rest. Many times you will not be able to ignore behaviors that become severe, but this is when your crisis management plan will come into place. 7. Never take something away that the student has earned. If they earn it, it's theirs. Remember, these children are used to everything being taken away and losing privileges. 8. Also, moving a clip down on a clip chart or flipping a card for bad behaviors, do not work well with ED and ODD children. Most of the time, asking a child that is ED or ODD to move a clip down or flip a card will only escalate their behaviors. Avoid it! While I use a clip chart in my classroom, my ED and ODD students are exempt from it. They use a token system instead or a cool points chart. You can read all about my "Cool Points" charts here and find token boards here. You can read about my whole group token board here. 9. Put a positive reinforcement or token system into place asap once you've completed your reinforcement assessment. It may not be possible to have this in place right away, as you need to get to know the student, but do it as soon as possible. 10. Positive reinforcement must be POWERFUL! Don't just assume because you think all kids love gummy bears that this child will. That is why the reinforcement assessment is so important. It must be something that is powerful for them!!! Something they want so bad, they are willing to do anything to get it. Always make these reinforcements available only contingent upon good behavior. 11. Increase and decrease the frequency of reinforcements as needed. For example, an ODD student that is disruptive every 10 minutes will need opportunities for reinforcement more frequently than a student that is disruptive every hour. 12. Be proactive by seating the child near positive role models. 13. Teach the student calming techniques and strategies through the use of social stories and providing them with their own calm down kit. Autism Adventures has a good one here that also includes a social story that I use in my classroom. 14. Be a good listener. Encourage them to talk about their anger and frustration once they have de-escalated. Provide them with replacement behaviors. Build that trust! 15. Begin collecting data right away on the frequency, duration, and severity of behaviors to assess the progress of the reinforcement system. If progress is not being made, then you need to make some adjustments. You can find some timesaving charts here that I use to take data on behaviors in my classroom. These are just some quick tips to help you with the first week of school! Remember, no two students are the same. What may work for one, may not work for the other. Get to know the child and make adjustments as needed! If it's not working, change it! Here's to a great first week of school! 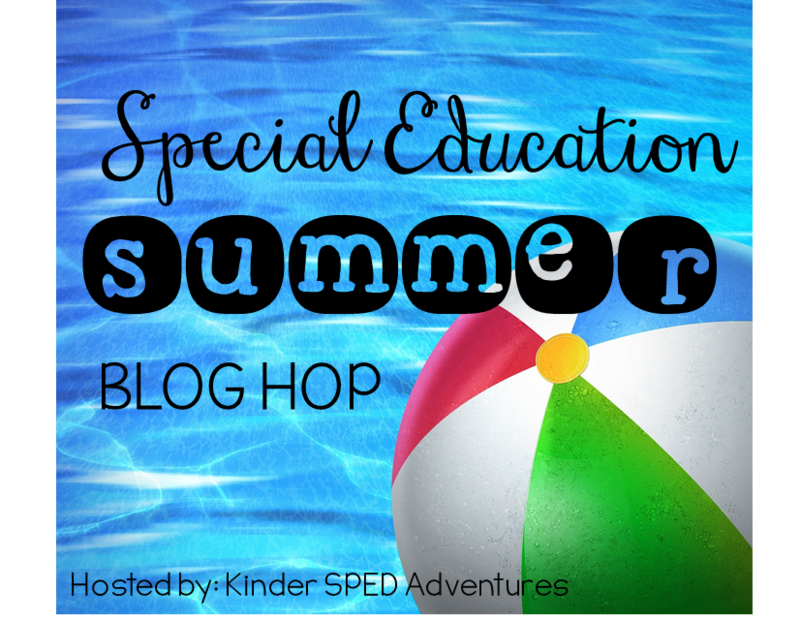 Now head over to My Special Learners for more tips!